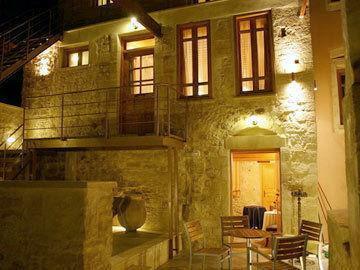 Located in the centre of the old town in Rethymnon, close to various museums and monuments, this hotel is set in a beautifully renovated Venetian palace dating back to the 17th century. The airy, spacious rooms maintain this historic style with distinctive furnishings, and in the courtyard guests will find three Venetian pillars alongside a unique octagonal Ottoman fountain. All rooms are fully equipped to provide the visitor with an ambient environment that merges the romance of bygone eras together with the comforts of our modern times. The guests can relax and enjoy breakfast or drinks in the pretty courtyard and venture out into the town to visit its wonderful historical attractions, including the Archaeological Museum of Rythemno, the Venetian harbour, and the Venetian fortress. Room facilities (Standard room): Individually adjustable air conditioning, Shower, Double bed, Internet access, Hairdryer, TV, Mini fridge, Bathroom, Bathtub.